Armed Trans People Will Not Get Bashed! 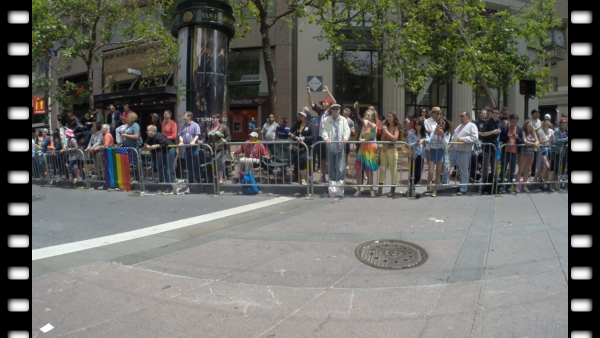 The San Francisco Chapter of the Pink Pistols, a pro firearm self defense group marches in the SF LGBT Pride Parade. Armed Gays, Lesbians, and Transgender people will not get bashed is the mantra of the pro-gun group the Pink Pistols. The Pink Pistols founded in 2000 in Massachusetts has had at least 45 chapters throughout the U.S. The San Francisco Pink Pistols participate in San Francisco Gay Pride parade, and they turn heads. Firearm ownership has in the past been associated with conservatism, but the Pink Pistols idea that armed gays, and transgender people don’t bashed, supercedes any political ideology. Hate crimes against transgender people occur regularly, and sometimes those crimes end in death, but it is common knowledge that criminals or haters will NOT mess with someone who is armed. §Giving up sound bite at the parade. There is always someone who hates on people, and it is my opinion that anytime anyone opposes self defense is in effect sending a very bad message. The police can't protect you, your friends cannot protect you, so the only way to stop a hate crime in it's tracks is to arm yourselves.